I’m not sure what it was, but it took me almost four days to finish this book, and that is a first for me!!!! And that doesn’t mean the book was boring, on the contrary it caught me way off guard with its surprising twist and it just shows how good and enjoyable are Lisa Jackson/Nancy Bush books. Elizabeth Gaines Ellis is a typical housewife, mother and a professional caring for her daughter Chloe and trying to come to terms with her cheating husband’s death. As much as she considers herself normal, her gut says there’s more to her than what she is feeling. People she is upset with are turning up dead. Strange things and dreams are making her question her sanity and her daughter’s insight is as puzzling as the obsessive love letters she receives. Into her perplexing life, add a twist of Rex and Ravinia and her life goes for the loop. She battles instant attraction to Rex, and is wary of her so called cousin Ravinia. She wants to accept the gift she and her daughter are bestowed with, yet is scared for the lives of the ones she cares. “Wicked Ways” takes you on a journey of danger and evil as one woman’s birth comes full circle to her present life. It is a twisted story of an obsessive evil lurking in the shadows to claim its next victim to be with the loved one. And it is a mysterious and soul-searching journey of Elizabeth as she comes to grip with her own identity and roots, even as she opens herself to love again. 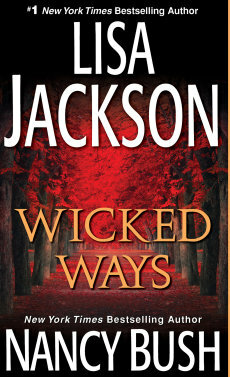 “Wicked Ways” keeps you wickedly interested and entertained. There are a few parts that may seem to drag, but as it gets to the penultimate climax, it keeps you on the edge of your seat. Received an ARC from Kensington Books via Netgalley for an honest review. « Moonlight In Winter Park – Bombshell Romance!! !